You do not need to be a massage therapist to give your partner a beautiful face massage. The face holds onto our emotions and stress so it is very therapeutic to have someone work out the tension in our faces. Buy some milky face lotion or ask your local beauty store which cream would be appropriate for face massaging. 1) Sweep the cream (using both hands) from the chin up to the temples and then onto forehead. 2) Massage the forehead: Start with fingers and make circular motions with both sets of fingers across the forehead; using gentle pressure. Ensure your nails are kept clear of the skin. Now place your fingertips between the eyebrows and gently pull them simultaneously toward the temples. Do this several times to release the tension. 3) Temple Massage: Now place your fingertips on each of the temples and massage the fingertips in a circular motion, applying only very soft pressure on both sides. 4) Jaw & Cheekbones: Place each of your thumbs under your partner’s jaw, with your index fingers pointing up to rest against either side of the nose. Then move your whole hands upwards and outwards, so that they slide along the cheeks towards the ears. You can deliver occasional massages to the jaw using circular motions with your thumbs. 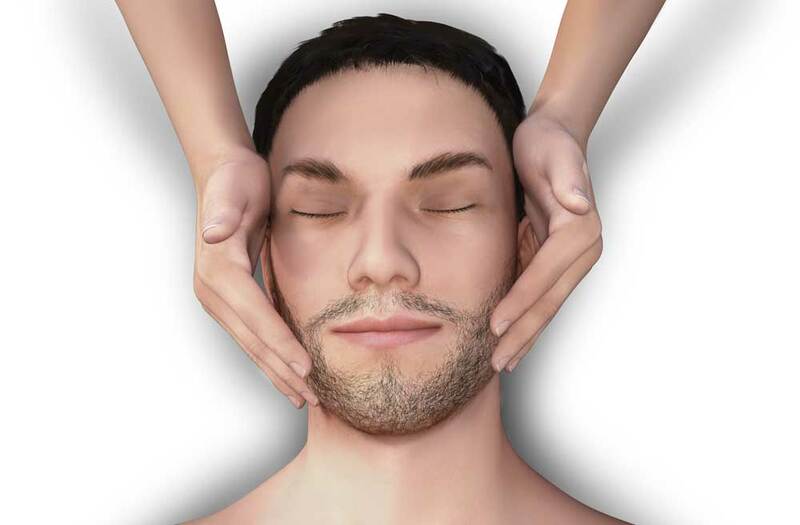 5) Complete the face massage with a gentle massage to the neck and around the around the ears.